Introduction: The first total synthesis of ω-phenyl Δ6 fatty acids (FA) and their cytotoxicity (A549) and leishmanicidal (L. infantum) activities are described. The novel 16-phenyl-6-hexadecynoic acid (1) and the known 16-phenylhexadecanoic acid (2) were synthesized in 7-8 steps with overall yields of 46 % and 41 %, respectively. The syntheses of the unprecedented 10-phenyl-6-decynoic acid (3), 10-cyclohexyl-6-decynoic acid (4) and 10-(4-methoxyphenyl)-6-decynoic acid (5) was also performed in 3 steps with 73-76 % overall yields. The use of lithium acetylide coupling enabled the 4-step synthesis of 10-phenyl-6Z-decenoic acid (6) with a 100 % cis-stereochemistry. The cytotoxicity of these novel FA was determined against A549 cells and L. infantum promastigotes and amastigotes. Among the ω-phenylated FA, the best cytotoxicity towards A549 was displayed by 1, with an IC50 of 18 ± 1 μM. On the other hand, among the C10 acids, the ω-cyclohexyl acid 4 presented the best cytotoxicity (IC50 = 40 ± 2 μM) towards A549. Results: Based on caspase-3/7 studies neither of the FA induced apoptosis in A549, thus implying other mechanisms of cell death. 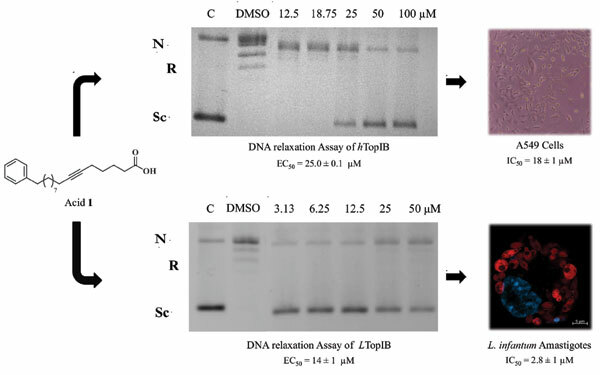 Conclusion: The antileishmanial studies were performed with the top Leishmania donovani topoisomerase IB (LdTopIB) inhibitors, namely 1 and 2 (EC50 between 14 and 36 μM, respectively), acids that did not stabilize the cleavage complexes between LdTopIB and DNA. Acids 1 and 2 displayed cytotoxicity towards L. infantum amastigotes (IC50 = 3-6 μM) and L. infantum promastigotes (IC50 = 60- 70 μM), but low toxicity towards murine splenocytes. Our results identified 1 as the optimum ω- phenylated acid of the series. Keywords: Acetylenic Fatty Acids, Cancer, Leishmaniasis, Leishmania infantum, Synthesis, Topoisomerase IB. Keywords:Acetylenic Fatty Acids, Cancer, Leishmaniasis, Leishmania infantum, Synthesis, Topoisomerase IB. Abstract:Introduction: The first total synthesis of ω-phenyl Δ6 fatty acids (FA) and their cytotoxicity (A549) and leishmanicidal (L. infantum) activities are described. The novel 16-phenyl-6-hexadecynoic acid (1) and the known 16-phenylhexadecanoic acid (2) were synthesized in 7-8 steps with overall yields of 46 % and 41 %, respectively. The syntheses of the unprecedented 10-phenyl-6-decynoic acid (3), 10-cyclohexyl-6-decynoic acid (4) and 10-(4-methoxyphenyl)-6-decynoic acid (5) was also performed in 3 steps with 73-76 % overall yields. The use of lithium acetylide coupling enabled the 4-step synthesis of 10-phenyl-6Z-decenoic acid (6) with a 100 % cis-stereochemistry. The cytotoxicity of these novel FA was determined against A549 cells and L. infantum promastigotes and amastigotes. Among the ω-phenylated FA, the best cytotoxicity towards A549 was displayed by 1, with an IC50 of 18 ± 1 μM. On the other hand, among the C10 acids, the ω-cyclohexyl acid 4 presented the best cytotoxicity (IC50 = 40 ± 2 μM) towards A549.